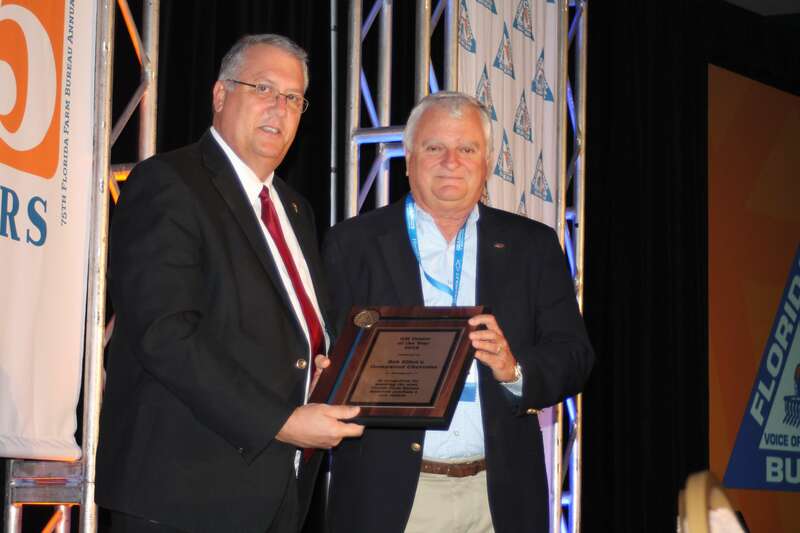 Orlando, Fla. – Bob Elliott’s Greenwood Chevrolet in Fort Meade received Florida Farm Bureau’s GM Dealer of the Year award at the at the state organization’s annual meeting in Orlando on Oct. 27. The dealership was the leading provider of the exclusive Farm Bureau $500 membership discount in the state. Ninety-eight Farm Bureau members used the $500 bonus cash benefit. “The Farm Bureau discount program with General Motors is exclusive to Farm Bureau members and we want to thank Mr. Elliott for his continued support in helping our members get the most for the dollar and his support of our program,” stated Florida Farm Bureau State Director Jeb Smith. To receive the discount, members must show they have had a Farm Bureau membership for 30 days and bring a Farm Bureau Bonus Cash certificate to the participating dealer. Certificates can be printed at fbverify.com/gm. The membership name and address must match the vehicle title information. To find your nearest participating GMC dealer, visit https://www.shopclickdrive.com/gmc/.